Geologists and geophysicists rely on ground penetrating radar (GPR) to gather high resolution subsurface information rapidly. MALÅ Geoscience manufactures the only commercially available GPR borehole system that can perform surveys deeper than 30 meters, due to the use of fiber optic cables for communication. In fact, the MALÅ Borehole Systems have been used successfully to depths in excess of 2500 m.
The need of knowledge of subsurface conditions are in many cases vital to make the right decisions concerning underground constructions, hydrogeological models, estimation on volumes of different earth material etc. 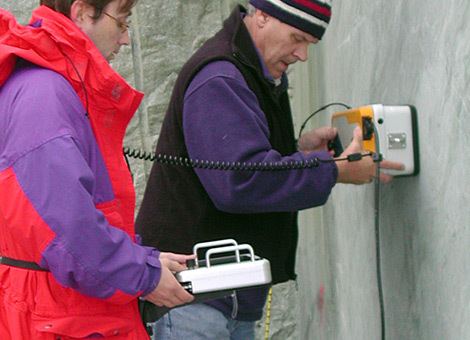 When using borehole radar as an investigation tool in front of constructions in mine shafts, valuable information on what fractures to meet and by that the risk of flooding of the construction site is gained. To drill boreholes (horizontal to vertical) prior tunneling work and carry out borehole reflection measurements can in many cases be the only way of estimating how to continue the construction and in which part precautionary measures should be taken.